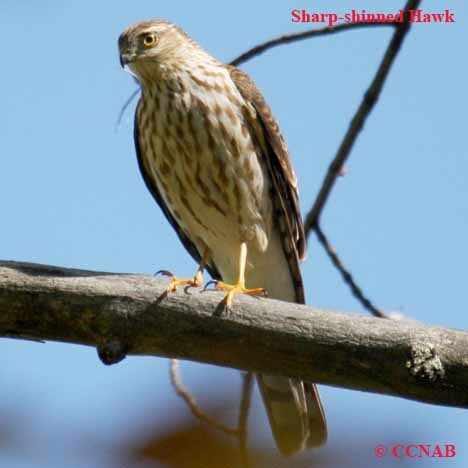 Species: The Sharp-shinned Hawk (Accipiter striatus) is the smallest member of the accipiter family. Known as a bird of the northern taiga, it is common as far north as to the treeline. 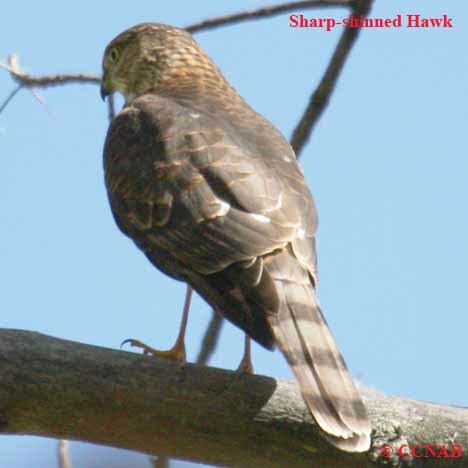 This grackle size hawk preys on mostly small birds, sometimes eating small animals, rodents and insects. 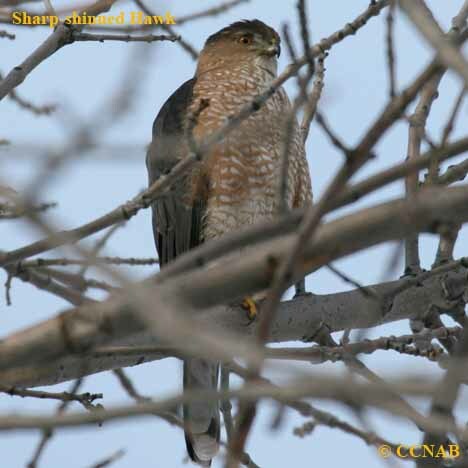 Similar in appearance to the larger Cooper's Hawk (another member of the accipiter family), having the same bluish-grey back and orange coloured barred breast. Distinctions: The males and females are similar in appearance, females are larger than male birds. Adults have bluish-gray backs, orange coloured barred breast, having red eyes. 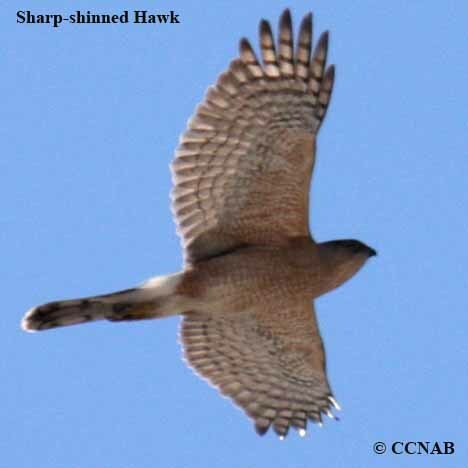 Appears to have a small head, which seems hidden by its wings, when seen in flight. Wings are short and rounded, long square tail, showing at least three equal size bands, appears to have a center notch when folded. 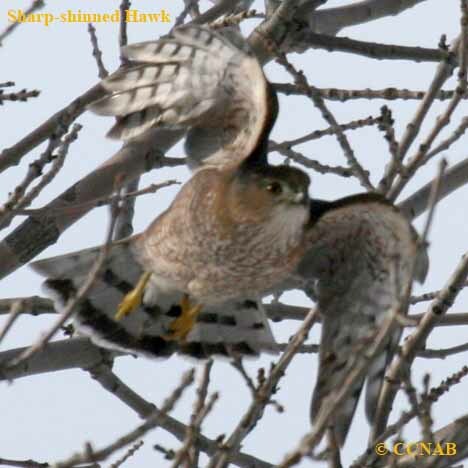 The juvenile is brown, with breast streaks and yellow eyes. Voice: Repeated cries, what one would expect from a bird of prey, silent most times, unless disturbed around its nest. Nesting: two to three whitish-blue eggs, with brown spots, one brood per year. 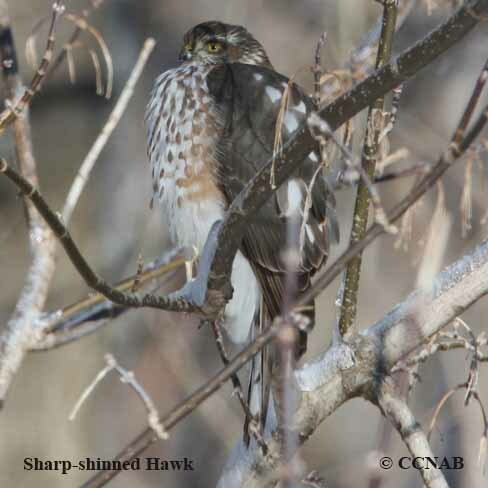 Usually, builds its nest in a conifer, hunts in coniferous, deciduous or mixed forest. Distribution: Breeds throughout all the forests in Canada during the summer months. Lives and breeds in some western and eastern locations of the USA all year around. 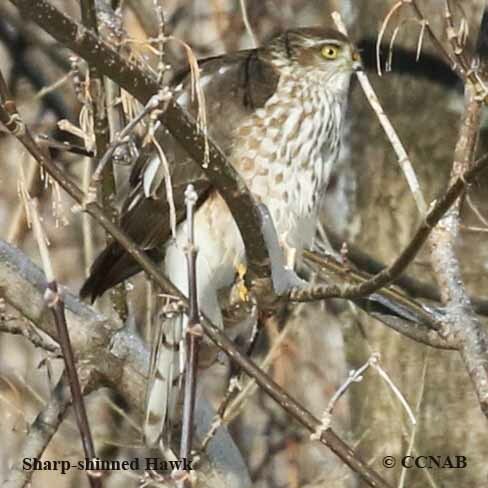 Seen from Newfoundland and Labrador, west to Central British Columbia, south to Southern California, all the way east, to the southern tip of Florida in the non-breeding season.